I have the same thing happen and I only have 2 cats. I fall alseep without cats and wake up in a weird position that doesn’t do my rheumatoid arthritis any favors either. I have one cat on my left side and the other between my legs and i’m on my stomach. Adorable! Is there anything cozier than sleeping cats? LOL! I have two cats, and the female (Cochara) will take the whole bed, usually, and force Ginger (the male) to sleep else where, unless I’m there. Nestled in among the cats, of course! Aren’t you lucky! 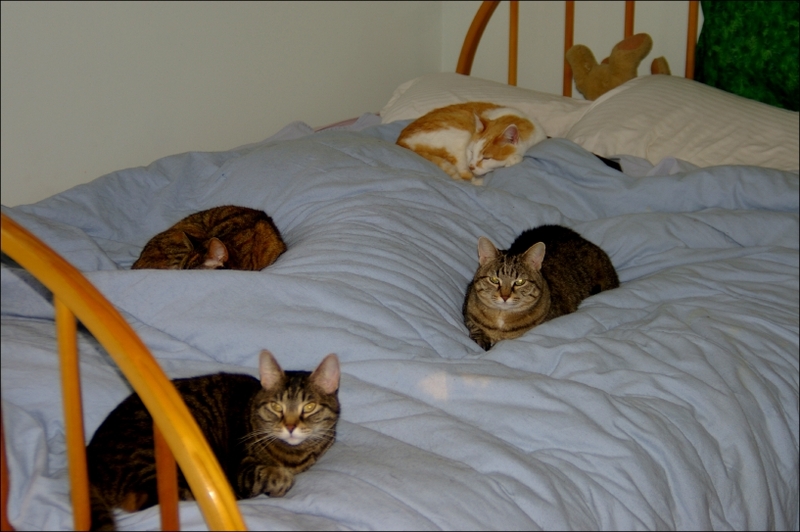 Some years ago, for a period of about 6 months, I lived in a household that had a total of four cats and two dogs. (Not my companions, but I “borrowed” them just the same :-) ) One had to live in the basement (he simply could not get along with two cats who had lived in the house before he got there), and the fourth cat spent all her time on the ground floor and thus never came up to the bedroom level of the house. One of the dogs (Roxanne) totally adored her companion human and always slept on a dog bed right outside of his and his wife’s bedroom door. But one of the dogs did frequently sleep on my bed next to me (medium size dog). And two of the cats occasionally joined us. One night, when Roxanne’s companion human was away for the weekend, leaving her pining for company, I woke up to discover that I had TWO medium size dogs AND two cats all sleeping on my bed with me! At least one of the cats I think was sleeping on top of me, at least until I woke up and moved! LOL! They left you a pillow, so if you assume the pretzel shape, you’re good to go. LOL! Now I know approximately what a cat considers “personal space”. Cute! Can’t blame them, the bed looks awfully comfy!